The NEET 1st phase, earlier known as the All India Pre Medical Test aka AIPMT, was conducted on 1st May 2016. But as reported the phase 1 had various issues. So, it went under consideration by the Supreme Court and the apex court finally gave the decision to avail another chance to appear in NEET-2, who appeared in NEET-1 considering the fact that many could not appear in the first exam, or many did not perform well in the wake of uncertainty. There were a total of 4.7 lakh candidates from India and abroad who have applied for the NEET-2 exam scheduled to be held on July 24, 2016, still out of which, about 70% are re-appearing for the test after surrendering their NEET Phase I scores. 2) to extend the date of registration for NEET -2, which ended on June 30. “The CBSE board has facilitated it more by making the downloading of the Admit Cards of NEET – II along with a format for affixing a Postcard size photograph. It is essential for the candidates to download the Admit card via the link provided by the CBSE Board as the admit cards will not be sent by post to the candidates anymore. • Visit to the official website of the test i.e. • Click on the link NEET-2 Admit Cards 2016. 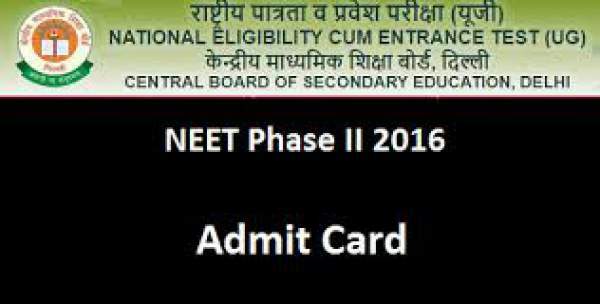 • The NEET-2 Admit Cards 2016 will be displayed on your screen. • Save it and take a print out for future purposes. Stay tuned to The Reporter Times for latest Education news and all government jobs updates across the nation. Don’t forget to share it on social media sites to let your friends also know about it.